SEE LOCATON IN 2000 A.D. The Smethport Glass Company, also known as the Hilton Window Glass Company, was owned by Robert, Hugh, and John Hilton. 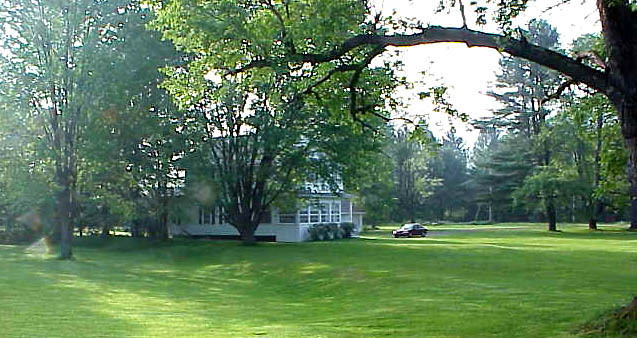 It was located in "Dog Town" on the west side of Smethport. The Hilton also owned the Allegany Window Glass Company in Port Allegany as well as the Keystone Glass Company in Hazelhurst, PA. The Hilton glass plant was bought by Thomas Camp, one of the owners of the Camp Glass Company. When his brother moved the Camp Glass Company to Mount Vernon, OH, Thomas remained in Smethport. In 1920, the plant was hit by a tornado. It was severely damaged, but it was rebuilt and continued to run until 1925, when it was dismantled and sold to a salvage company. The area where it stood is between Marvin Creek and the Shawmut Railroad Grade and the houses on Hilton Avenue and is now covered by woods. Owing to the fact that the flatteners and cutters were not working the blowers and gatherers of the Smethport Window Glass Company's plant of last weeks as the factory was filled with unflattened glass. Tuesday morning one of the flattening over was placed in operation and yesterday afternoon the managers of the factory informed the MINER that considerable glass had been flattened and cut ready for shipment and that chances were good for soon having that department of the plant in regular operation. From present indications the blowers and gatherers may be able to resume work the last of this week. Ed Sloppey, of East Smethport, an employee at the Smethport window glass factory, met with a painful accident while at his work last Friday. The young man was assisting in removing a large cylinder of glass from one of the blowing machines when it bursted, a piece of the flying glass striking him on the back of the left hand, making a bad wound and severing a artery. The wound was attended to by Dr. Chadwick, and while it proved to be a painful one it caused no serious injury, outside of incapacitating him from work for several days. Sloppey has had more than his share of accidents during his service at the glass factory. Last winter he received a number of injuries in a manner similar to the one last week. On one occasion he has a narrow escape when a piece of glass penetrated his back, inflicting a dangerous wound. Dr. Ostrander amputated the left leg of Joseph Robinson, a glass worker, who has been an inmate of the County Home during the past two years, yesterday, between the knee and thigh. The leg had been infected with gangrene for several months. Robinson is 70 years of age, and went through the ordeal finely. 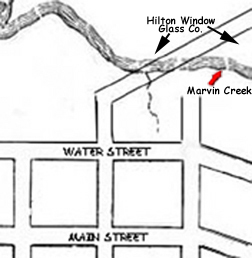 Location of Hilton Window Glass Factory in 1895 on Hilton Avenue. Today this is a private residence.